The second edition of The Nobile Folios is prefaced by Wendy Baron, the prime authority on Walter Sickert's work and life. Vernet's Dance Hall was painted by Sickert during the winter of 1920-21, most probably in Dieppe, and presents Sickert at his most ambiguous. Clues are virtually nonexistent, shapes are eccentric. 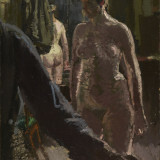 Wendy Baron suggests that the painting does not depend on our understanding of the subject, and that it is much more interesting if it is seen as a gateway to the intriguing insights it affords into the uncompromising objectivity of Sickert's eye and his mischievous intelligence. It is these qualities that Bethan Stevens addresses so successfully in her short story 'Daily Mirror'. Presented as a set of letters written to The Daily Mirror by 'an Appreciator' of the paper, a haunting story unravels that says as much about the early 20th century music halls as Sickert's painting.